As a fine art photographer and art director, Eugénie Frerichs' professional life centers around contextualizing the "wild." Born in the Colorado Rockies and raised in the Pacific Northwest, Eugénie now lives in Ojai, California. Passionate about conservation and fueled by an unending curiosity about the nuances of nature, her perspective on capturing and considering modern wilderness feels especially timely amid a season punctuated with reminders that nature resides outside our control. 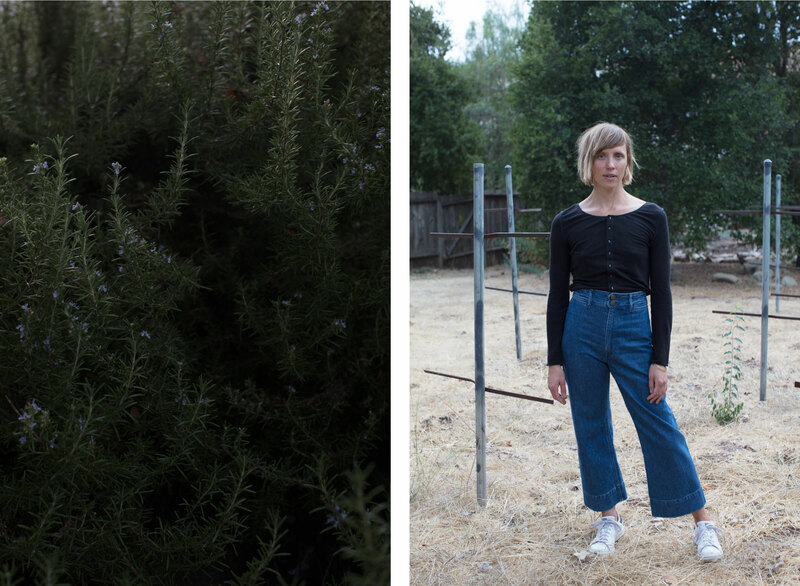 At the onset of fall, we visited her in Ojai to discuss going analog, channeling John Muir, and what it feels like to allow yourself to care deeply. Can you share more about your upbringing and background? What might a stranger be curious to learn about you, or what background might give them context into who you are today? I am very much a product of the people and the places of my youth. I was born in the Colorado Rockies and raised in the Pacific Northwest, and have been migrating between the mountains and the West coast ever since. I’m equal parts my mother and my father, one a feisty environmentalist musician, the other an avid researcher and historian whose curiosity about everything leads to great bouts of vivid storytelling. Both were good about exposing my older brother and I to wilderness from a very young age – we didn’t go to church, we went to old growth forests. I just turned 40, and reflecting on this first chunk of life I still think my parents have shaped me more than anything else, but so have a few other things: A long career as a dancer; a long career in the photo industry; some very informative years living in mountain towns in Colorado and Wyoming; and enduring some life-changing losses at a relatively young age, including my mother, who died of cancer when I was 20, and then in my early 30s a medical snafu which led to partial paralysis of my left leg, and the need to redefine my physical self from athlete to something else. After losing my ability to dance and run and ski I entered a more contemplative phase of life that it turns out I really enjoy. So, all the hardship, while incredibly difficult, led me to a better place. I’ve morphed into a feisty environmentalist whose curiosity about everything leads to great bouts of storytelling – basically, I’m turning into my parents. Your own work is grounded in the “modern wild.” Tell us about this. I first started using the phrase “modern wild” in 2012. I was questioning the idea of wilderness in a time when in fact wilderness might no longer exist. I was curious about all the ways people were experiencing the “wild” instead, whether it meant ditching out on society to live somewhere off the grid, going feral at Burning Man, or reconstructing natural ecosystems in the middle of cities. Eventually this exploration led to looking back in history at some of our early champions of wilderness, and I developed a year-long obsession with the conservationist John Muir. The 100-year anniversary of his death was in 2014, and that year I read as much of his writing as I could and eventually pitched an idea to the Mountainfilm Festival in Telluride to attend the festival in character as a John Muir disciple, dressed in wool knickers and reading his writings on street corners like some kind of wilderness zealot. Surprisingly the festival went for it, and the performance was to date one of the weirdest yet most invigorating things I’ve done. I think our culture could use a little dose of Muir’s level of passion. If you read his writing today, the euphoria comes off as pretty over the top, but it really makes me wonder, Who, or Where, is the John Muir of our time? Why aren’t dedicated conservationists the celebrities of our day, as Muir was 100 years ago? I mean, he took the President of the United States camping in Yosemite, so adamant was he about the transformative experience of wilderness and sleeping outside. Could you imagine taking Trump camping? I would love to do that. Dear Mr. President, let’s go spend a night outside under the stars. For you, how and where does photography meet and intersect with conservation? How do you see the power of photography providing a space to say, to capture, to comment in a way other mediums don’t? People are more likely to put time and resources towards protecting something if they have a personal connection to it. So in the simplest sense, photography can help in the process of getting people to care. It’s a gateway – you see a beautiful photo that blows your mind (or a tragic photo, for that matter), you want to go to that place, maybe one day you go, and the personal connection begins. I don’t think photography does this any better or any worse than other mediums – a virtual reality tour of the rainforests of the Tarkine, for example, would be pretty hard to beat – but photography lends itself especially well to contemplation, which itself can lead to a deeper connection. A photograph doesn’t change, but our perception of it will, the more time we spend with it. This is one of my favorite aspects of still photography – the luxury to spend as much time as I want with a single picture. There is also the act of making the picture in the first place, and how that leads to a deeper connection and eventually action. For many photographers, myself included, the medium is simply the excuse to get out into a landscape, to be there alone, to sit still and truly observe and experience a place. It’s the great slowing down. After I’ve spent a long time somewhere, I start to see it and appreciate it in a different way, and this too leads to caring more deeply, and wanting to work to protect something. What senses, sensations, and emotive realities are most defined for you when you’re out in nature? Slowness, stillness, courage, youthfulness, humility, clarity. Without question, I am the best version of myself when I am out in nature. We’re always learning and relearning, discovering and rediscovering parts of ourselves. Tell us about what you’re learning about yourself at the present moment. Lately I’ve been re-learning how good it feels to go analog. I know I sound like I probably already spend most of my time dressed like a pioneer and cruising around by horse and buggy, but in truth, I spend the overwhelming majority of my days working at my computer, so I need an antidote. I’ve started riding my bike to work more often than driving, I sold my digital camera setup and replaced it with a 4x5, I’m cooking from scratch instead of eating out, I left social media and try to avoid looking at my phone unless I really need it. All of this has led to more time and space to look outside of myself and pay attention to my physical surroundings. It’s crazy that this is something I’ve had to re-learn, but dang, technology will gladly take all your headspace if you’re not careful. What are some personal non-negotiables when it comes to maintaining your own sense of “wellness”or “balance”? At present: Heavy doses of yoga, bicycles, the ocean. Also: No more social media. As one of my teachers once said, If you have 20 minutes to check Instagram, you have 20 minutes to meditate. I’d rather meditate. What is a current curiosity for you? Two years ago I moved to southern California, so my main curiosity has been: How the hell does a Pacific Northwesterner survive in southern California? In Oregon, we were raised to have a disdain for this part of the world. But it turns out living on the coast can be pretty great. We live less than a mile from some very nice surf breaks, so since moving here I’ve been learning how to knee board. If you don’t know what that is, look up YouTube videos of the great George Greenough. I’m kind of obsessed with him (and his haircut). How do you address periods of procrastination or self-doubt? I can only marvel at how easily my brain is able to convince myself that one day I am worthless and without a creative bone in my body, and the next day I am brilliant. Surely I am neither of those extremes, and I have to remind myself when self-doubt sets in that it too shall pass. Is there a metaphor, a quote, a piece of writing, or visual composition that is speaking to you right now?